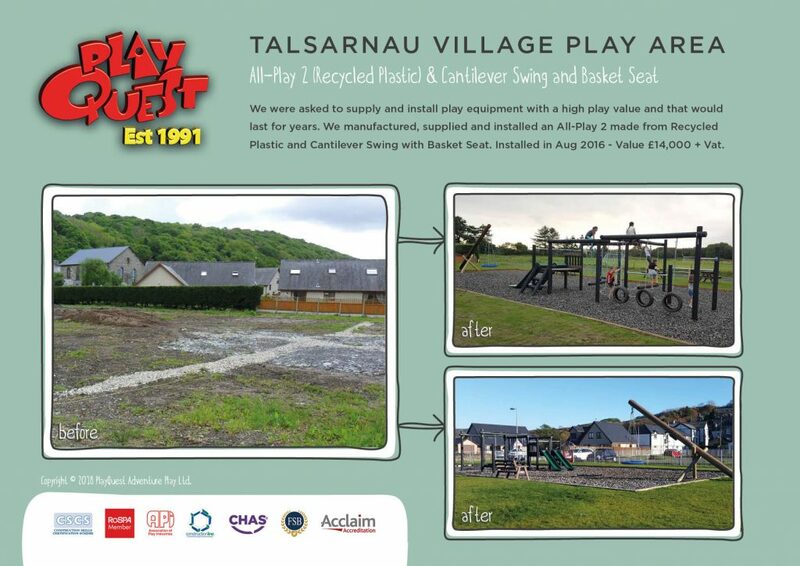 Talsarnau Village Park Committee approached us to discuss the design and installation of new play equipment for a dedicated new play area in their village. Having discussed several designs – as well as material options – they opted for one of our All-Play 2 High Level multi-play frames – manufactured from Recycled Plastic. This meant that the Village received a fantastic piece of play equipment for use by lots of children at one time – along with the 25-year guarantee on our Recycled Plastic play equipment that PlayQuest offer. Along with the All-Play 2, the committee also included one of PlayQuest’s timber Cantilever Swings with Basket Seat – to encourage social and interactive play. While swinging, rocking, and risk taking, children can enjoy sensory stimulation and learn about weight and gravity. The play area was completed with rubber crumb safer surfacing.